After remaining non-responsive for more than 5 hours, the RRB Group D result login page for accessing the normalized marks and PET status is back now. 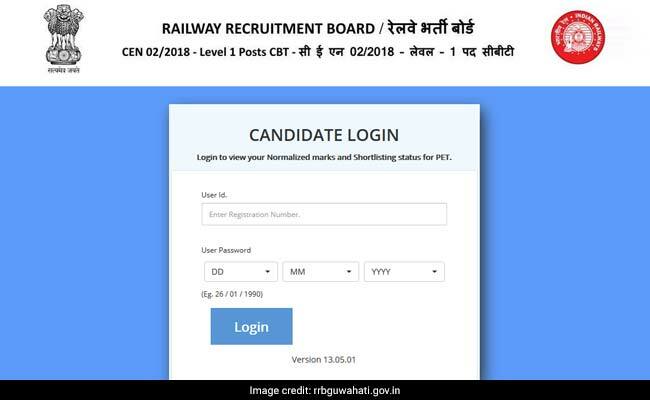 By logging into this link, the candidates who have appeared for the RRB Group D exam may check the marks they secured in the exam along with the status of their Physical Efficiency Test or PET, the next level of RRB Group D or Level 1 2018 recruitment process. Meanwhile, if you are searching for the RRB Group D result or shortlist for PET, click here. Along with the RRB Group D result, the Railway Recruitment Board or RRB has also released the marks every candidate secured in the Computer-Based Test or CBT held from September 17, 2018 to December 18, 2018. But, for accessing the normalized marks scored in the RRB Group D result and short-listing status for PET, candidates need to log in through the link provided here by entering their Registration Number and Date of Birth in DDMMYYYY format till March 15, 2019.